Properties in Whistler Golf Club average 4.5 out of 5 stars. Property 8: One bedroom with Space, comfort and location 150 meters to lifts and Village. Property 9: Where The World Comes To Play! Property 10: Valhalla #5 - VILLAGE location, walk to everything! - Hot Tub, Free Shuttle, Parking & WIFI! 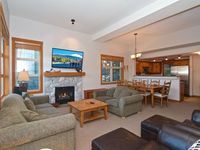 Property 21: Whistler Two Bed Townhome steps to ski lifts and village! Best location! Property 22: Whistler two bed Townhome steps to lifts shuttle on 1st fairway of best golf! Property 25: Whistler Village North, 1 Bedroom Townhouse, Great Location!! Newly Renovated 2 bed, ski in/out, perfect location for summer & winter! Property 38: Newly Renovated 2 bed, ski in/out, perfect location for summer & winter! 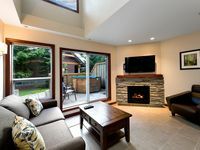 Relax in style, steps from Whistler village with outdoor pool & private hot tub! Property 46: Relax in style, steps from Whistler village with outdoor pool & private hot tub! Rating Details: The property manager was very helpful. The vacation rental was very clean. I was very happy with the location. I was more than satisfied with the condition of the vacation rental. Overall, I recommend this vacation rental. Reviewer Comments: Small for 5 adults but clean, private hot tub, lots of towels and kitchen extras. All the appliances and media worked great. We loved our stay and the condo worked well for us. The upstairs master suite had plenty of space for us and our toddler and the other two bedrooms were spacious enough to move around in (but not much more). The living room had plenty of seating and the entry way/boot room was fabulous! The walk took us a bit because we have small children but it was doable. The kitchen was lacking things to cook with, so be prepared to bring your own knives, baking pans/dishes, etc. There were plenty of dishes and silverware so if you aren&rsquo;t cooking you will be fine. Upon arrival the home smelled strongly of smoke but it was nice enough outside that we could open all the windows for several hours to air it out. A maintenance person did come offer to spray febreeze in the house. Our concerns were listened to and we felt well taken care of.